My favorite way to wear big, bulky sweaters is with skin-tight bottoms, like tights and a skirt or jeggings. It's actually quite practical, because if your core stays warm, your extremities stay toasty as well. 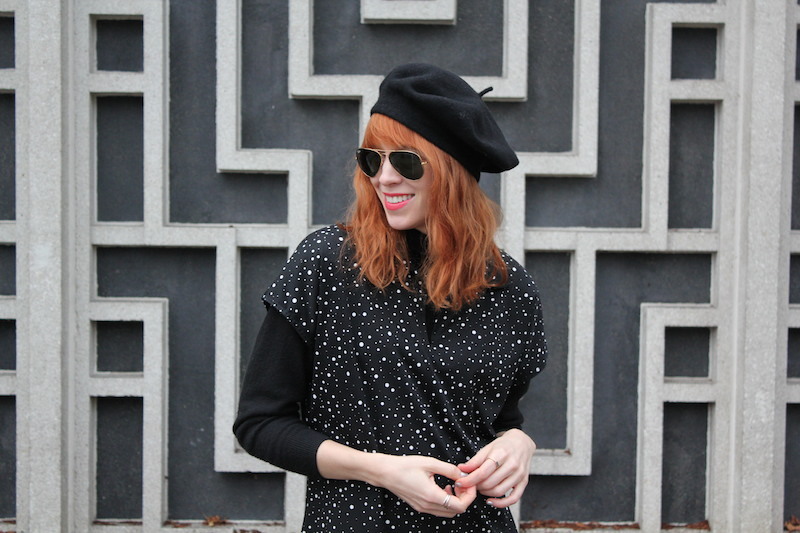 I paired this chunky vintage sweater with a black dress, thick black tights and minimal accessories. The jade necklace was a gift from my sister — she got it in New Zealand. In other news, I had two delightful things happen to me today and one not-so-delightful. Let's do the good news first: I found my black leather jacket! I'm not sure if I'd blogged about this, but about a month ago, I misplaced my BELOVED black leather bomber jacket, an irreplaceable vintage beauty that was supposed to serve as my fall coat. I seriously mourned that jacket and thought about it every day. But then my mother called me at work today and told me that she found it in her coat closet! Crazy! I guess I'd left it there the last time I visited. Made my day. The other good news is that I bought a car today! It's a two-door Hyundai Accent. I wanted something really tiny so I'd get good gas mileage. It's ice blue and super cute!